Dream – On a narrow road I am driving fast and come up on two slower cars. I brake a bit and then go around them. 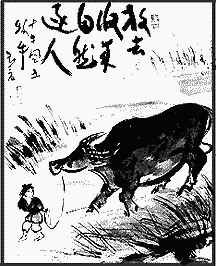 I continue driving fast and just ahead a man is leading onto the road three huge laden oxen. I brake and then brake all the way. I take a breath and slowly follow the oxen. This is a recent dream that reminds me how quickly I can climb into my vehicle of “supposed to, have to, need to, get ‘er done” and how that mind state speeds me up. In working this dream with my own dream teacher, Rodger Kamenetz, he immediately pointed out that I don’t even know where I’m going…but I gotta go there fast! It’s this place that can seem that I have a sense of purpose but the dream doesn’t show evidence of that…and in that place I lose connection to what’s going on inside of me…the outer can occlude the inner. When I have a lot going on, which I do right now, this way of being can easily slip in and my dream is calling me back to another way of being that I also know well…oxen time. The oxen are unmistakable here as they evoke for me my zen training and this feeling of chasing after the busy mind versus being in the present moment…the eternal now. While this is healing in me, I can still feel that when something is requested of me I not only have to agree to do it…I have to get it done immediately. This is clearly not true yet it can still feel that way in my body if less so now in my mind. Here, as Rodger notes, the whole road is stopping me…an ancient road…and I’m invited to slow down. And at first I don’t. I drive around the first two cars so the dreams ups the ante. Now there are oxen being brought onto the road. Even in the dream I sensed the man bringing the oxen onto the road in front of me was intended to slow me down, that he knew exactly what he was doing. And in that moment I knew I wasn’t going to be driving around this. This is what we would call the Sacred Encounter. I don’t always recognize or meet the sacred encounter in my dreams yet in this one I do. I brake…I brake again…and then slow down…and enter oxen time. Mary Jo Heyen is a Natural Dreamwork Practitioner working with clients in person, phone or Skype. Learn more about her work with dreams at www.maryjoheyen.com.